Potential Grads: Please take a look at the Scholarships, Awards, and Bursaries application package that has been prepared for you by Student Services. 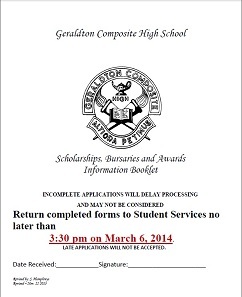 The deadline for applications is March 6, 2014 at 3:30pm. Please see Mrs. Humphreys if you have any questions. Definitely apply! These various awards can help put a dent in your college or university expenses! You can access the application package by clicking here for a PDF version or you can click here for a Microsoft Word version.